The Able Assist Adjustable Transfer Aid can be used around the home to help provide a safer and easier way of transferring a client. This is the adjustable leg version of the 12064. Maximum user weight of 185kg. The able assist adjustable transfer aid has adjustable legs to make transferring a person easier. The aluminium frame is very robust and has a maximum user weight of 185kg. The able assist is light to use and easy to move. The able assist enables the user to participate in transfers which could improve muscle tone. 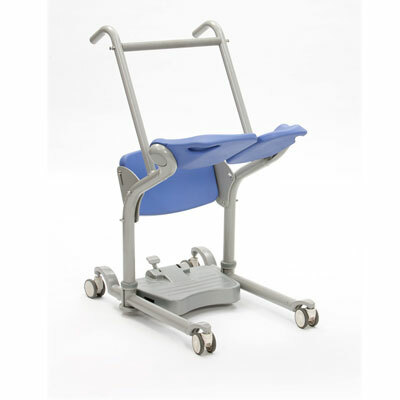 Its ideal for those users who can raise from a seated position to a standing position. The user can have their legs supported by the knee brace and then hold on to the horizontal bar which would be in front of them. The 4 wheels (2 wheels are braked) enable the aid to be moved easily from room to room. As the transfer aid is narrow in width, this enables the carer to move through standard doorways more easily.